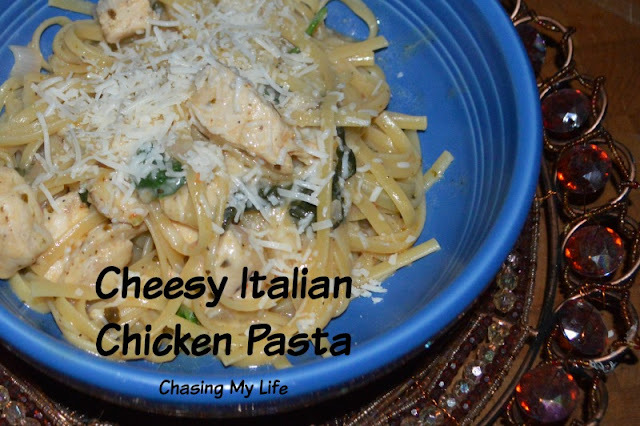 I love this recipe because it is quick, simple and only uses a single pan! In a 5 quart large saute/stock pan arrange half the spinach, tomato pesto, garlic, onion, chicken and linguine on the bottom of te pan. Sprinkle with the Italian seasoning, salt, pepper and crushed red pepper. Pour chicken stock and wine over top. Cover and bring to a boil over a medium high heat. Cook 7-9 minutes until pasta is al dente. Toss pasta with tongs occasionally to keep the pasta from sticking to the bottom of the pot. There will still be liquid in the pan when the pasta is done cooking and that's perfect as it will be the base for the cheese sauce. Turn off the heat and add the cheese to the pasta. Toss pasta with tongs until the cheese melts into the pasta. *If you don't have any dried Italian Seasoning just make your own by combining 1 teaspoon dried basil, 1 teaspoon rosemary, 1/2 teaspoon oregano and 1/2 teaspoon dried thyme. **My pot is just a bit smaller than the length of linguine so I halve mine before putting it into the pot.